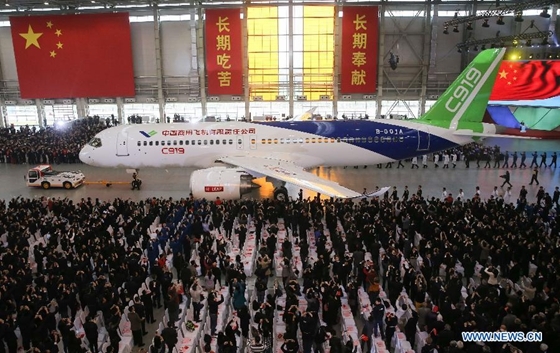 The C919, the first large passenger aircraft designed and built by China passed the last expert assessment on Tuesday, its manufacturer announced. The aircraft was given the go-ahead to begin a series of high-speed taxiing tests, the last step before its maiden flight. The process usually takes one to two months. According to Shanghai-based Commercial Aircraft Corp. of China (COMAC), 25 experts from Chinese research institutes, civil aviation administration, and domestic jet makers formed Tuesday's assessment panel. They reviewed the preparedness of both the aircraft and ground services for the maiden flight. In March, the aircraft passed a major technical assessment. The C919, with over 150 seats and a standard range of 4,075 kilometers, is a medium-haul commercial aircraft. The Chinese jetliner was rolled off assembly line in 2015. COMAC said 21 customers had placed orders for more than 500 aircraft by the end of 2016, and it expects sales to exceed 2,000. China has invested heavily in commercial passenger jet manufacturing. The ARJ21, its first regional aircraft, began commercial operations in June 2016.